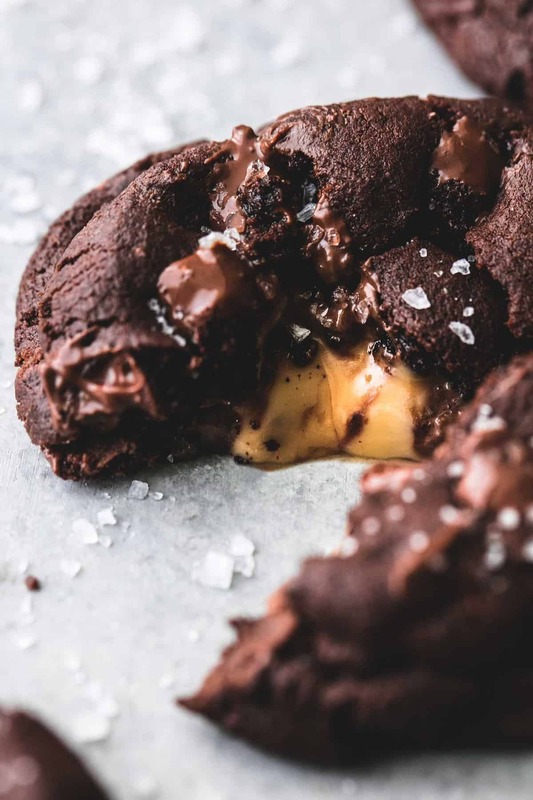 Ooey gooey Salted Caramel Stuffed Double Chocolate Cookies are super rich, chocolatey, and are the ultimate cookie dessert for sweet and salty treat lovers! 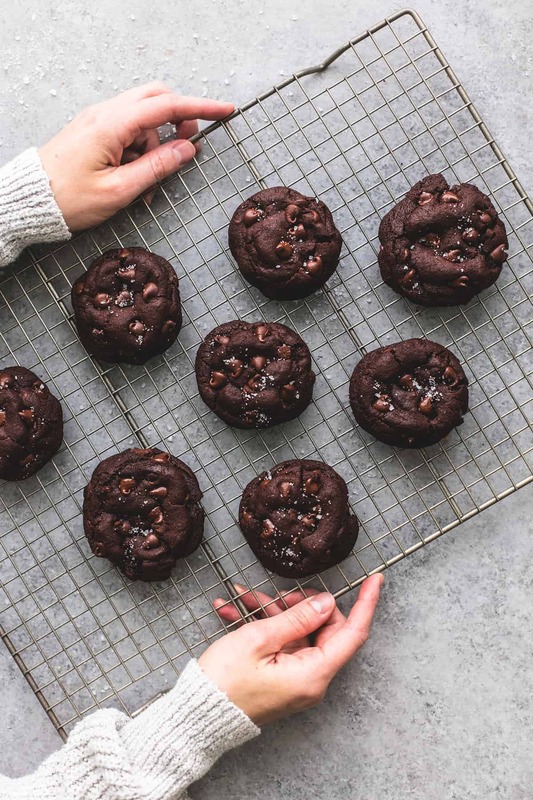 If you are a cookie lover, Best Super Soft Peanut Butter Cookies, Turtle Thumbprint Cookies, Fudgy Double Chocolate Cookies, and Copycat Swig Sugar Cookies are a MUST TRY. To me, a cookie needs to be more than one thing. As in, it needs to satisfy a couple of cravings at once. Sweet, of course, but also something else. Sometimes that craving can be for something sweet and crunchy, like these Peanut Butter Oreo Stuffed Chocolate Chip Cookies. Then, other times I want a cookie that is both sweet and (dare I say it?) 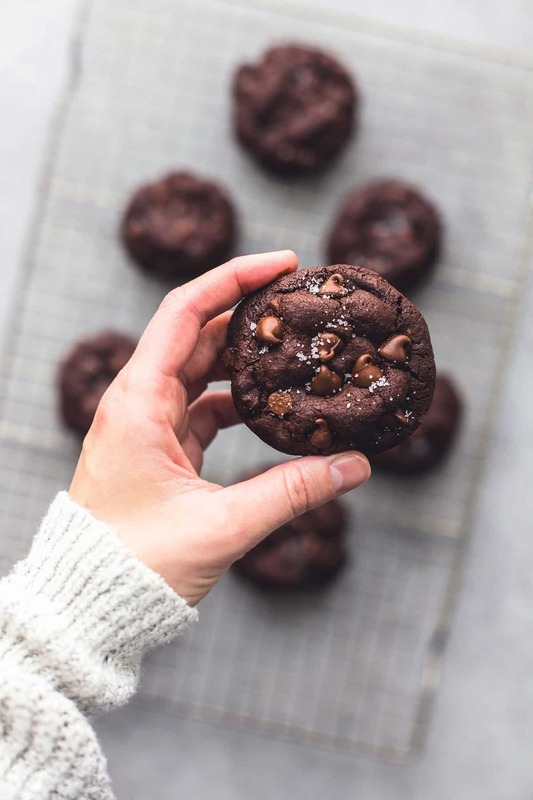 healthy like these Healthy Banana Chocolate Chip Cookies. 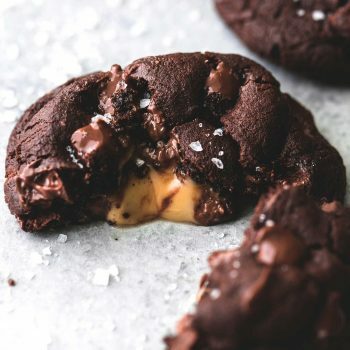 When I created the recipe for these Salted Caramel Stuffed Double Chocolate Cookies, I am pretty sure you can imagine what I was craving. That’s right, something sweet and salty. To me, the combination of those two flavors is simply where it’s at. I know I’m not alone in this, right? I like to eat these cookies straight out of the oven. Even though I KNOW they’re going to be hot, I can barely wait even a minute for one to cool down before I’m burning my fingers, trying to split it in half to make it cool enough for me to eat it (and still burn my tongue anyway). Soooo worth it. If you don’t like to burn your fingers and tongue though, these are great at room temperature as well, and the caramel will still be soft and chewy. 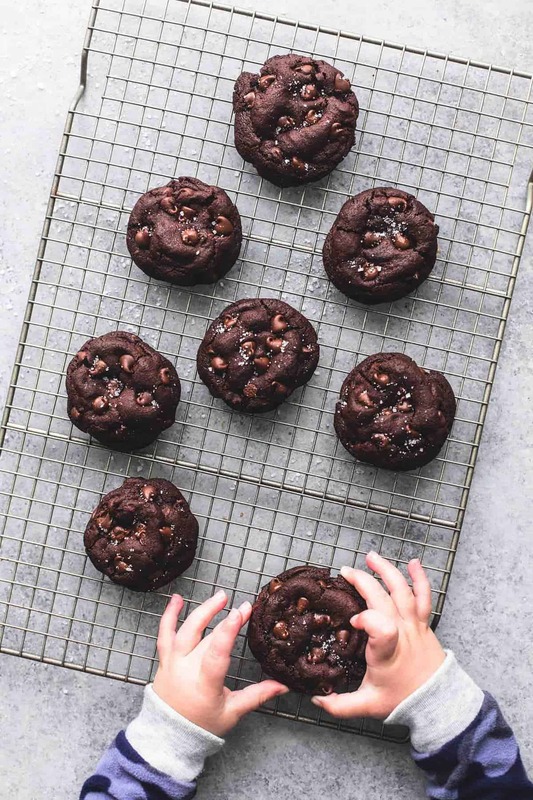 While these cookies are great to eat all yourself (or maybe even share a few with your family), they are also the perfect treat to make for when you have company, for a bake sale, as an after-school snack, a new neighbor welcome gift, to leave out for Santa, or even as holiday hostess gift. I think they are a little on the unexpected side and therefore, always the first to get eaten in any event. What Are Good Caramel Substitutes? While I made these with caramels in mind, there is no reason you can’t get creative with your cookies’ insides. You could follow the same recipe except substitute another soft candy for the middles (think peanut butter cups, not Jolly Ranchers). 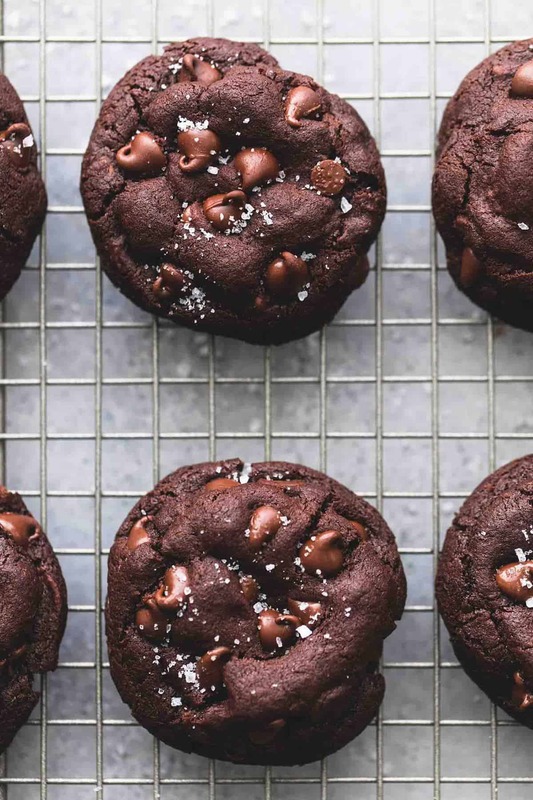 I have found that candies like Reese’s cups, Rolo’s, Dove chocolates, Hershey’s miniatures, and even M&Ms can work in the center of these chocolate cookies. Whether or not you include the sprinkle of salt at the end is up to you. I prefer salt with caramel, but you can leave it off or on or try it both ways to see which works best for your cookie palate. How Long Will These Cookies Keep? 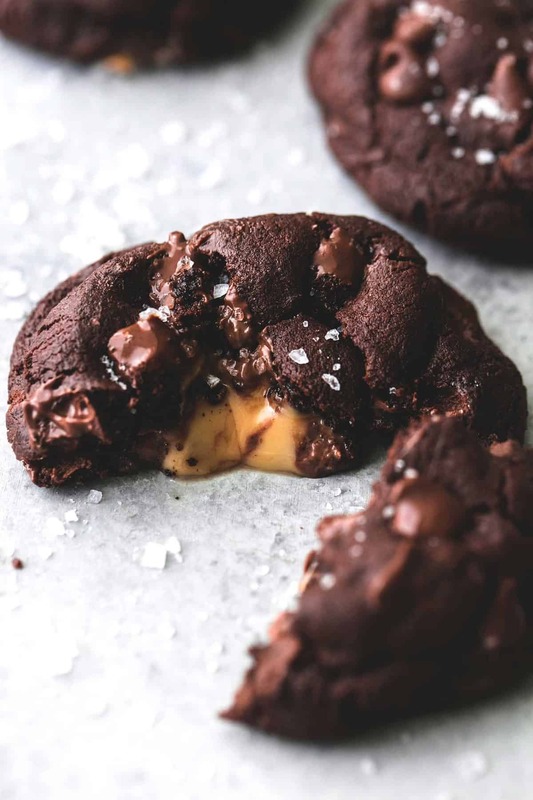 If you store the Salted Caramel Stuffed Double Chocolate Cookies in an airtight container, they can keep on your countertop or in your pantry for two to three days. If you choose to refrigerate them, they will last about a week, but keep in mind they will get hard in the fridge and you should leave them out to warm up (or pop them in the microwave) before serving. You can also freeze these cookies in an airtight container or Ziploc baggie for up to four to five months. What If I Don’t Have Coarse Sea Salt? If you don’t have coarse sea salt or sea salt flakes on hand, my recommendation in this case would be to leave off the salt entirely. You can’t really substitute table salt because it will sink into the cookie and just make it taste like you added too much salt or made an error in baking. The purpose of using a coarser salt is so that it “sits” right at the top of the cookie and so when you bite into it, you’re getting the bite of salt before you sink into the sweetness of the rest of the cookie. In a medium bowl whisk together flour, cocoa powder, baking soda, and salt. In a large bowl beat together butter, brown sugar, and sugar until light and fluffy (2-3 minutes). Mix in egg and vanilla until blended. Gradually mix in dry ingredients on low speed until just incorporated, don't over mix. Stir in the chocolate chips by hand. (I reserve 1/4 cup for adding at the end) Cover TIGHTLY and chill for 2 hours or overnight. Preheat oven to 350 degrees and take the dough out of the fridge while the oven is preheating. Roll 2-3 tablespoons of cookie dough into a ball. Break the ball in half and place one half on a baking sheet. Press a Rolo into the center of the cookie dough, top with remaining half of the cookie dough ball and press down on top of the Rolo to cover it completely. Press a few chocolate chips into the top. Repeat with remaining dough and Rolos, placing cookies about 3 inches apart on a baking sheet. Bake for 10-12 minutes until the tops of the cookies are just set. Sprinkle immediately with sea salt to taste, then allow to cool on the baking sheet for 5 minutes before transferring to a cooling rack to cool completely. Serve at room temperature for chewy caramel OR for melty caramel, pop a cookie in the microwave for 8-10 seconds (this is for my microwave, you might need to test with yours to find how many seconds yields a melted caramel center). Store in airtight container. Cookie dough adapted from Just So Tasty. More Cookie Recipes You'll Love! The ads on your blog have gotten out of control. I understand that ads are how you get paid, and I always appreciate the fact that I can get delicious recipes for free. However, the videos have gotten to the point where your website is almost unusable. The individual ads on each recipe photo from the main page get enlarged and cover up the entire picture. On this specific recipe page, I’ve had to reload it four times because some full screen video keeps popping up and preventing me from seeing the recipe at all. It’s really disappointing, and might cause you to lose readers if they can’t even read the recipe. I just found and opened the recipe and i haven’t found any ads which infringed upon it. It could be your device which is allowing excessive ads. Can’t wait to try out this recipe. Love it ! Keeper for holidays ! Thank you so much ! PERFECT for the holidays! 🙂 Thanks! These cookies are honestly one of the best cookies i’ve ever baked! i am a lover of all things cookie, but these are ranked right up there with my favorites. They are a little more work than the average cookie but they are well worth it. you will want to double the recipe though because you only get about 18 out of a single batch. Delicious!!!! The little bit of extra work is totally worth it, right?? Thanks for your feedback, Amy! Super excited to hear that you loved this cookies! Every year I make Cookie boxes with 7 different kinds of cookies and give them to friends at the holidays. I included this cookie and it was the runaway winner of the boxes. It’s cookie perfection! Can I be your neighbor? 😉 Super excited that these cookies were a hit for you this year! They’re one of my absolute favorites! !